Navigare Yachting is perfectly located to deliver a dream sailing holidays Greece adventure! The region's most beautiful and desirable islands are near our Greek yacht charter base at Agios Kosmas Marina, just outside Athens. 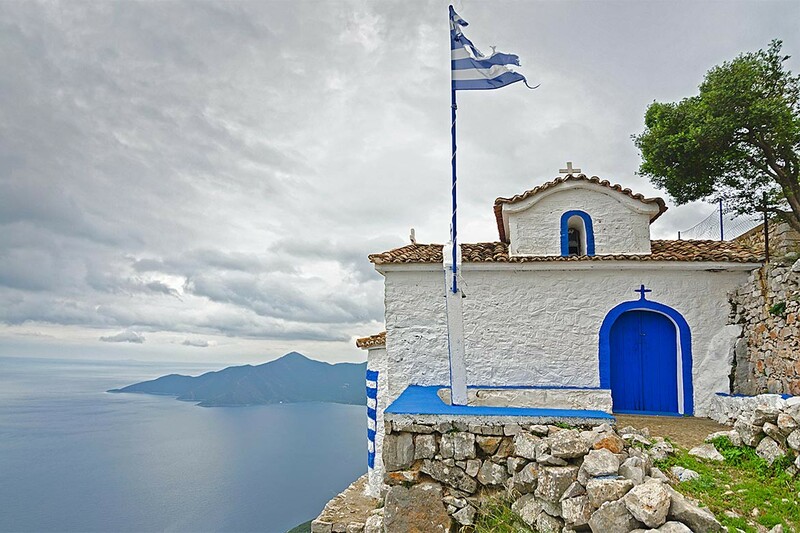 The Greek Islands are any sailor's dream destination: warm weather, azure Mediterranean waters, and friendly people on 6000+ islands seemingly scattered by the Gods themselves, the Aegean and the Cyclades bring you exciting new experiences every day. We make it easy and convenient to charter a yacht in Greece, with options to rent a sailing boat or catamaran Greece, as bareboat or skippered charter. 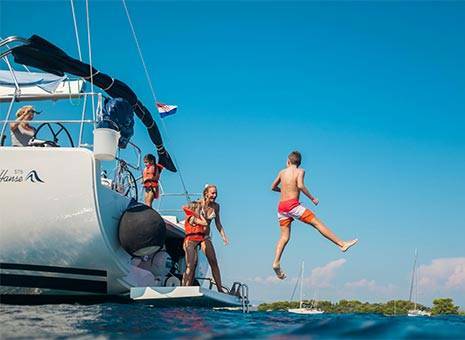 Check out our fleet of high quality boats and review our exclusive Greece Sailing Holidays Payment Plan, which allows you to pay for your Greek Islands vacation in up to six monthly installments. It's one of the world's greatest sailing destination and an amazing deal! 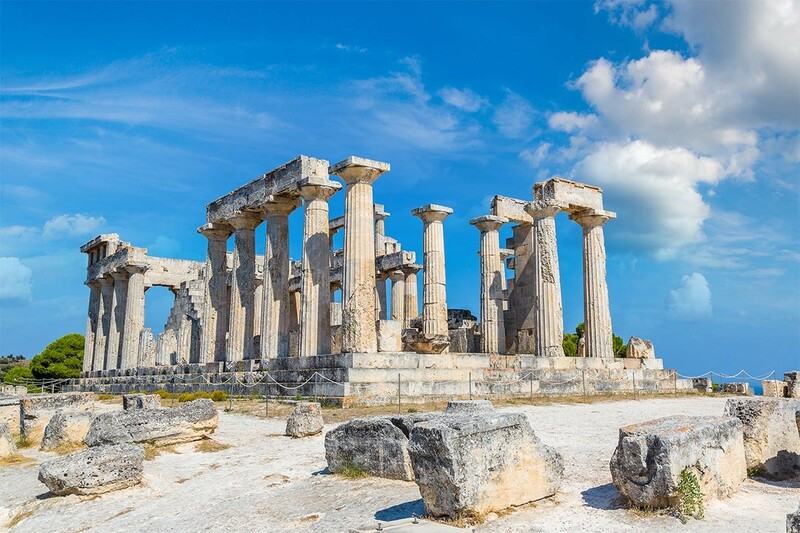 Explore destinations in the Saronic Gulf, the cradle of Ancient Greece. 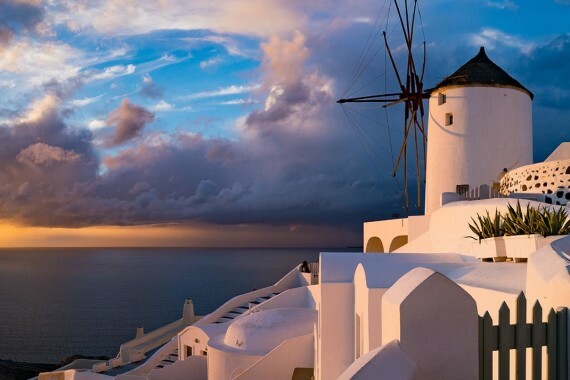 Visit the islands of the Cyclades and enjoy world class dining, entertainment, and leisure activities. Swim the warm, crystalline waters of the Greek Islands, amid hidden coves, dramatic cliffs, and picture-postcard villages. 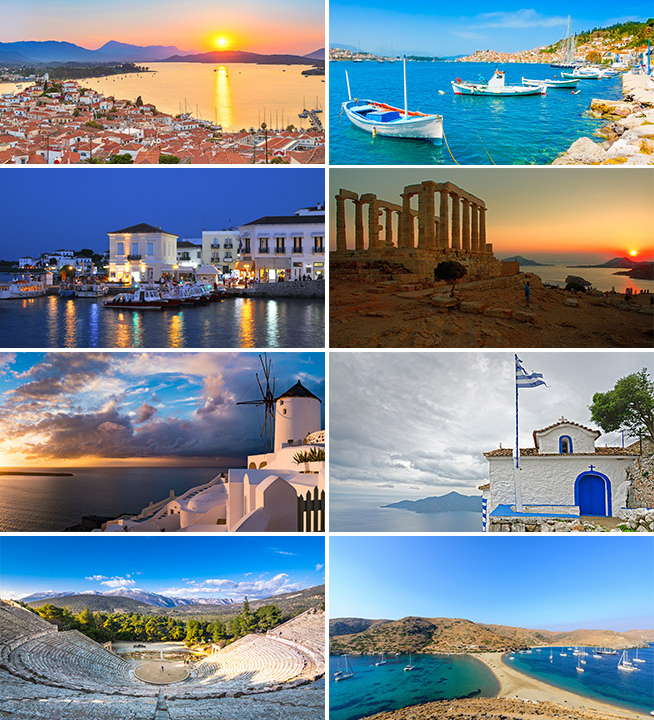 A Greek sailing vacation is the experience of a lifetime, and we can bring it to you. Check our current special offers and book online to save time and get the best rates! Discover picturesque villages with wonderful local hospitality and experience the friendly atmosphere of everyday Greek island life. Listen to the echoes of Gods, Goddesses, and ancient heroes, in a place where history stretches back thousands of years. Dance the “Sirtaki” and indulge in famous Greek cuisine, with specialties like souvlaki, mousakka and kleftiko. Saronic Gulf. The historic center of Ancient Greece, where you can tour ruins from antiquity, see short-beaked dolphins and fin whales, and enjoy proximity to the splendors of Athens. Kithnos. Explore dozens of picturesque anchorages and ports, or frolic along the idyllic coastline in the warm waters of the Aegean Sea. Serifos. 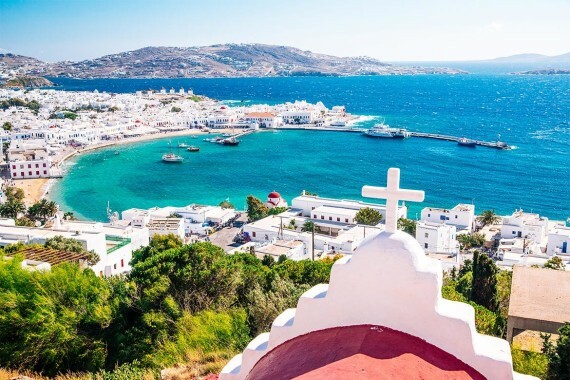 The towns of Chora and Livadi are the gateway to other destinations in the Cyclades and the harbor approach beneath towering cliffs is one of the scenic wonders of the region. Siros. 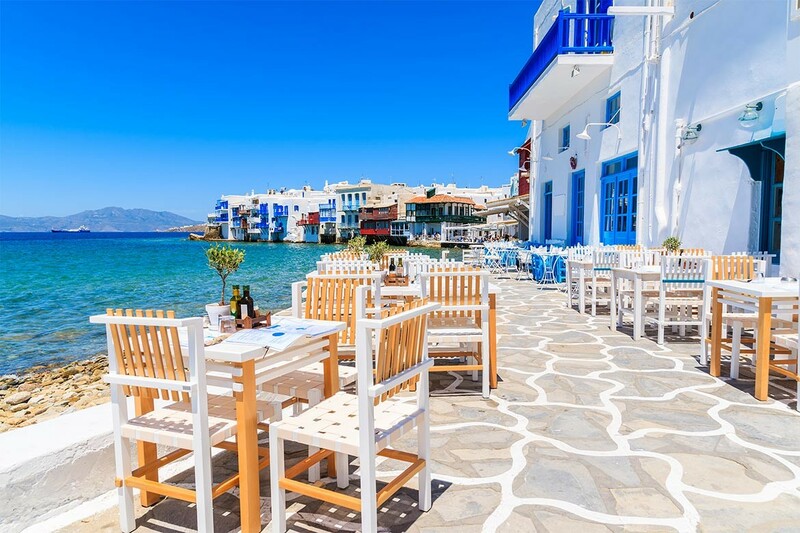 The beautiful ports of Siros are home to exquisite restaurants, entertaining bars, and welcoming hospitality, amid dramatic Aegean scenery that beckons you to explore. Kea. This is a major sailing Greece destination on the western fringe of the Cyclades, with abundant options for entertainment on land or in the warm sea waters. Poros. This Greek island getaway offers bustling activity on land and dozens of secluded harbors where you can settle in and enjoy the warm breezes and crystal clear water. Spetses. This glamorous island caters to a fun-loving luxury crowd, with irresistible options for dining and entertainment. Dhokos. This scenic island near Hydra is a popular day stop to enjoy the abundant coves and ancient shipwrecks, or overnight stop for dining and nightlife. Hydra. An incredibly beautiful and peaceful island that is little changed from the 19th century – no motorized vehicles are allowed! The harbor town is filled with boutiques, fine dining restaurants, and entertainment options, and the island is filled with trails, beaches, and natural areas to explore. When you book Greece sailing holidays with Navigare Yachting, it's also a dream deal! We offer an exclusive booking payment plan that allows up to six monthly installments. Check out our fleet of Greece sailing catamarans and sailboats, and yachts to get started on your booking. Navigare Yachting is here to welcome you to the gorgeous sights, epic history, and luxurious relaxation of sailing Greece islands in style. Book with us today to enjoy the best availability and rates. 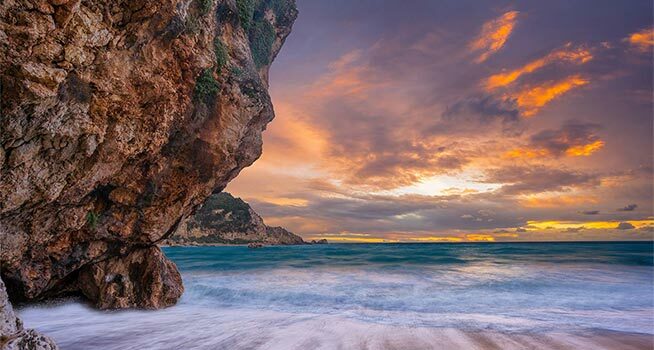 The Mediterranean climate of the Greek Islands is perfect for sun-seekers and ocean fun lovers, with abundant sunshine year-round. Summers are typically hot & dry, with long hours of bright daylight. Spring and fall are cooler, with seasonal precipitation and gathering winds. The “Meltemi winds” are hot and dry northerly winds that blow in the Aegean from mid-May to mid-September. Meltemi winds can arrive without warning and persist for days, though they often swell in the afternoon and die down each night. These winds typically provide good and steady sailing for the region, although they can be quite severe for short periods. Early season temperatures for March and April range from an average of 17°C during the day and down to 12°C at night. May and June are much milder, an average of 25°C during the day and 23°C at night. July and August are very hot, with temperatures reaching up to 35°C during the day and down to 23°C at night. Late season (September-November) temperatures are still very mild, an average of 23°C during the day and down to 19°C at night, with moderate precipitation. Winter temperatures are chilly and precipitation is common. Our Greece yacht charter season is closed from December through February. 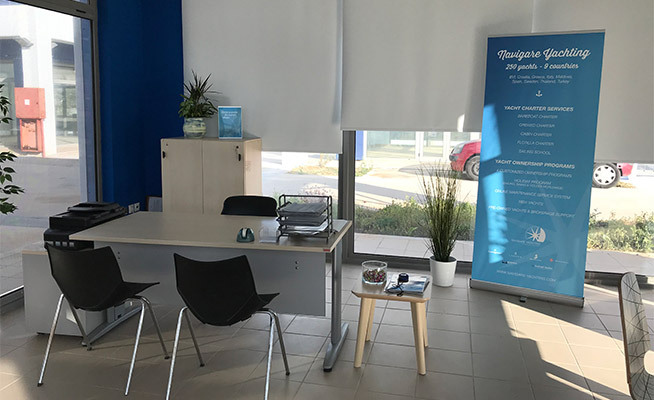 Our Greece yacht charter office is fluent in Greek, English, German, and Russian languages. LOCAL CUISINE: Authentic Greek is one of the world's most beloved cuisines, and experiencing the local food in person is one of the most thrilling and satisfying parts of sailing Greece islands region. Fresh seafood, of course, features heavily on menus and fresh local catches include calamari, swordfish, and lobster. Delicious Greek olives are a staple at almost every meal. 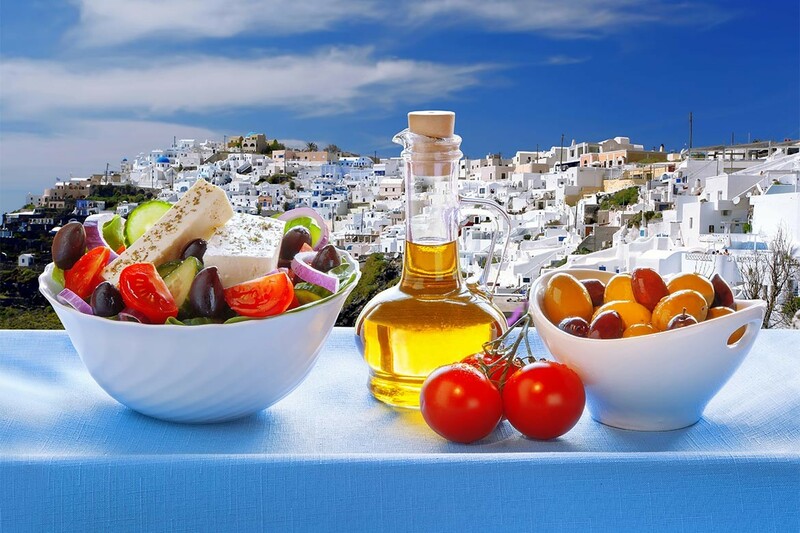 Delicious lamb, sausage, and pasta dishes are highlights, and Santorini wine is famous throughout the region. 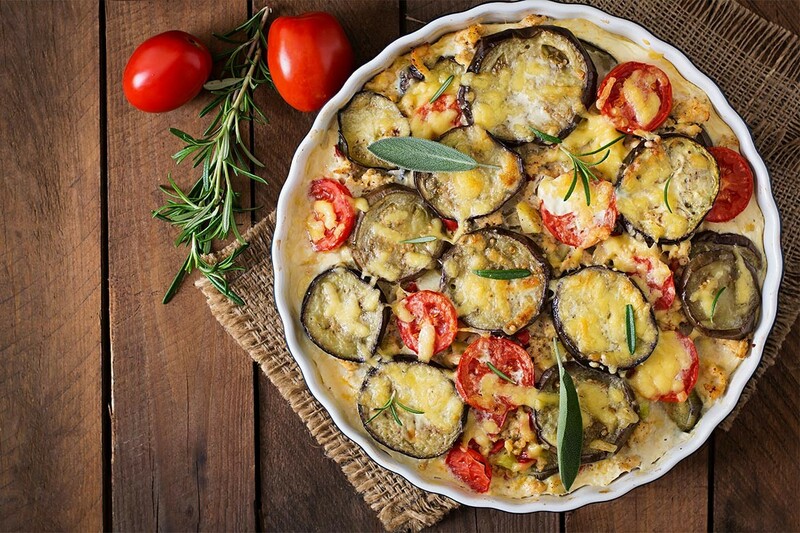 The range of influences in the Eastern Mediterranean, including Turkish, Italian, and Arab cuisines, ensures you can find anything you desire from the selection of local restaurants. While enjoying your catamaran or sailboat charter in Greece, you could stop into a small beach side cafe or reserve a fine dining dinner on one of the main resort islands. 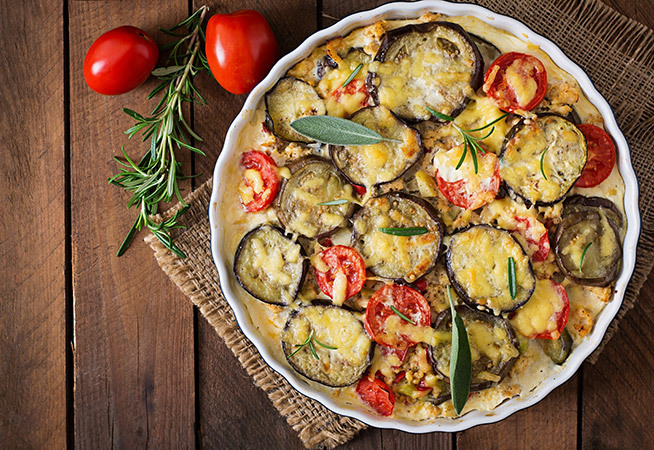 Eating is one of the most satisfying pleasures when you sail Greek Islands! Transfer from the airport to the marina is available by taxi or bus. The marina is well appointed with a full range of modern facilities. The location is conveniently near markets, restaurants, and bars, where you can begin or end your Greek sailing holiday in style. The warm and friendly islands of Greece are waiting, are you ready? Take a closer look at our fleet page, you can review our large selection of options to rent a sailing boat in Greece – we have Greece bareboat charter, skippered charter, sailboat charter, and catamaran charter options. Best of all, we make it easier and more convenient for you to plan your Greece sailing holidays vacation. Navigare Yachting offers an exclusive payment plan that allows you to pay for your Greece yacht charter in up to six monthly installments. Book your sailboat charter Greece today to find out how. 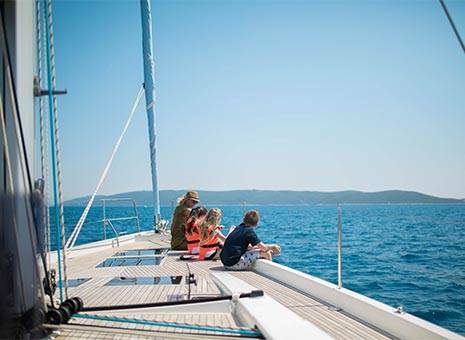 Benefit from more favorable prices for sailing in Greece during July and August. 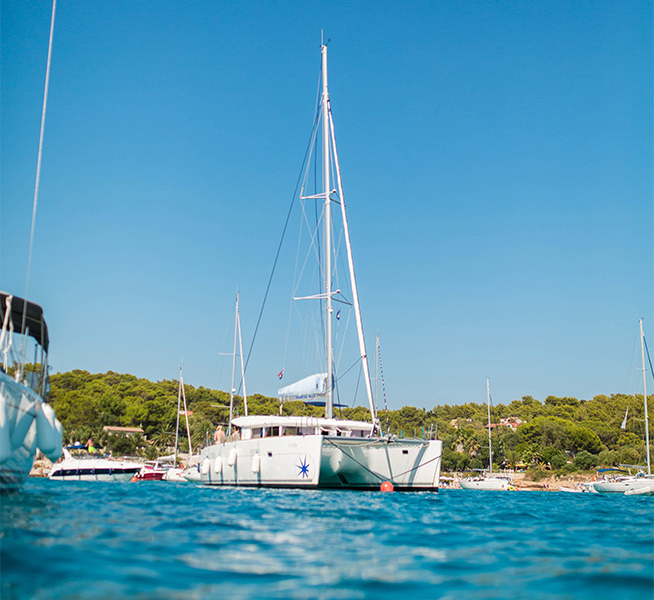 Check out selected yachts from our fleet in Greece, both catamarans and sailboats. Bareboat, skippered or crewed luxury yacht charter - browse our fleet in Greece to find the perfect yacht for your sailing vacation. 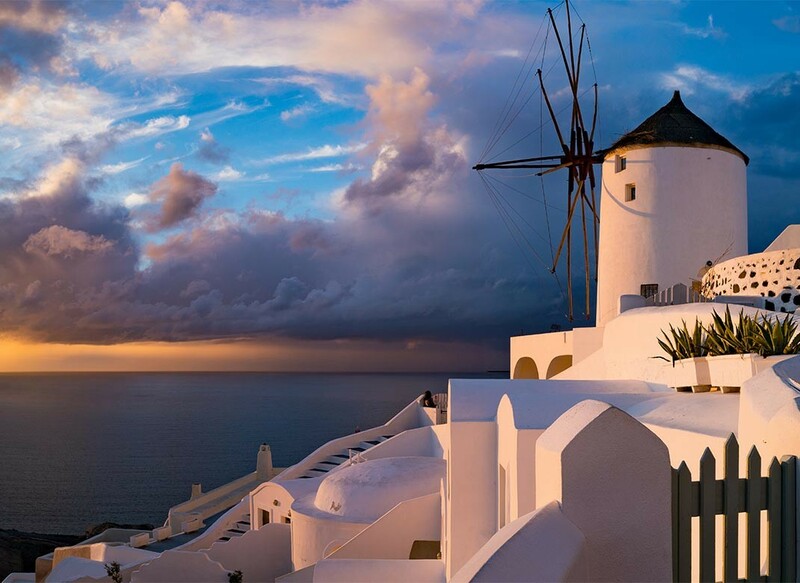 Sail away to beautiful Greece in one of our amazing iteneraries. 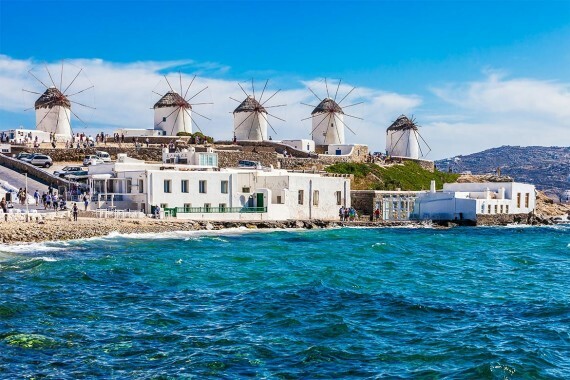 Sailing in the Cyclades is recommended to experienced sailors and you must be prepared to strong winds, but if you are, you may find good sailing as well as the traditional Greek style white and blue houses. Normal wind direction is from North. Arrival to Navigare Yachting base in Elliniko. Check in and provision. Leave for Cape Sounion. The bay at Akra Sounion is not a harbour, but can be a useful stop and to visit the 5th century temple of Poseidon. This is clearly visible on the Cape from a distance and is easily reached after a short walk. Anchorage at 37°39.2' N, 024°01.35' E.
When leaving after breakfast you may sail southeast to a bay on the west coast of Kithnos if the forecast predict a calm night, 37*24`5N 24*22´5E (25nm). There are actually 2 bays divided by a narrow sand reef connecting the main island with a smaller island south of the big one. You can choose either the east or the west bay. This is a nice place to stay in calm weather. If you prefer a harbor instead you can stay in Merichas only 2 nm south of the bays. From Kithnos you can continue to sail south to Serifos (26nm). The bay on the south coast is well sheltered from north waves although the wind may blow strong. The town (chora) is laying high above the harbor and from there you have a magnificent view. Now it´s wise to have a look at the forecast. If the wind forecast will be strong in the end of the week it may be time to start go back north again. If not, Kamares in Sifnos south of Serifos is worth a visit (11nm) but maybe Vathy another 4nm south is even better and more laidback. If you decide to move north again, Finikas at the southwest part of Siros is very nice (25nm). This small harbor is well sheltered except from south wind. You can go stern to a mole and in some places there you find mooring lines. You also can take a morning swim directly from your boat since the water is very clear. Siros was the capital island of Cyklades. Early last century greenhouses for farming tomatoes made the island prosperous and in the capital city Ermoupoli there were shipyards building big ships. From Finikas there is a bus to Ermoupoli as well as taxis. The town is beautiful with a lot of marble used in streets and squares, so it is well worth a visit and a contrast to the sleepy Finikas. This day you may sail to Loutra on the northeast side of Kithnos, 32 nm from Sifnos and 22 nm from Finikas. In Loutra the harbor is well sheltered from all directions if you stay inside of the mole. You will find a few taverns and you may be served your dinner on the beach. There is a hot well a few hundred meters from the shore and when the water reaches the waterfront it is still 40 degrees Celsius. A small “bathtub” is made on the east side of the beach where the spring water meets the sea and you can have a pleasant bath even in early season. The hot spring water bath is famous for its ability to cure different diseases. The harbor on northwest side of Kea is 21 nm away. When you arrive to the entrance of the bay you can turn starboard into the main port Korissia. There you can anchor and go tern to, but be sure to test your anchor grip as the bottom has bad holding at places. Instead of turning starboard you can go straight into the bay of Vourkari. There you can go stern to the mole (shallow a t places, check the Greek Waters Pilot). The place is calm with only e few taverns along the mole and one at the north side of the bay. If the weather forecast predicts north light wind you can stay in the southwest bay of Kea, 15 nm from Loutra, and enjoy a morning swim. Another alternative in calm weather or north wind is to sail to the bay at Sounio where you can anchor overnight. From Loutra it ́s 26 nm but from Sounio to Lavrio it ́s only 6 nm to sail on Friday afteroon. If the wind is strong on Friday it´s good to be in Kea since it´s 35 nm back to the Marina in Elliniko where you shall arrive at 18 O´clock to do the check out. At 9 O´clock it´s time to leave the boat. 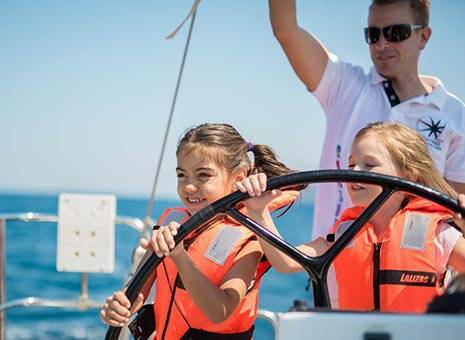 Sailing in the Saronic Gulf is recommended to experienced sailors. Normal wind direction is from NE. The 'Meltemi' begins around mid-July and builds up to full strength in August and early September, dying down towards the end of September. 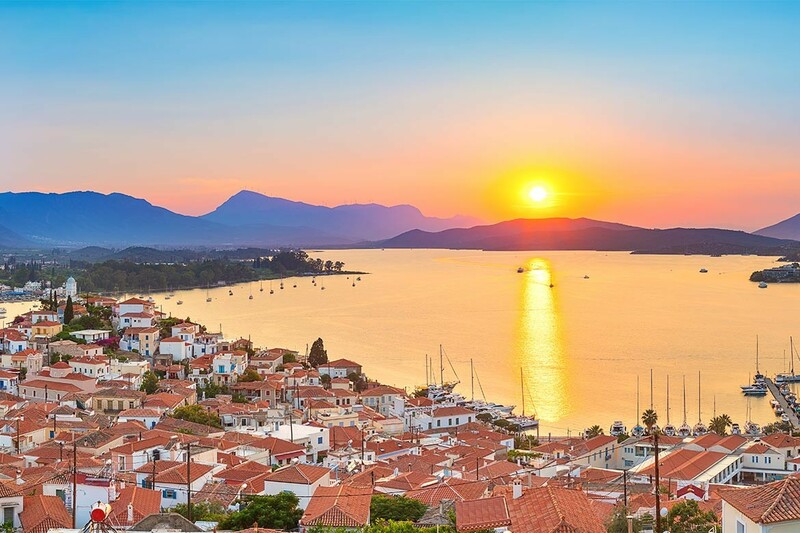 Head to Poros (30 NM), this island offers shopping, water sport activities as well as land activities – renting a bicycle /scooter or similar. For the kids there are several bays and beaches to explore for swimming. Mega yachts, fishing boats and sailing yachts all share the marina so if you want a good spot you have to arrive by early afternoon. There are many restaurants to choose from, we can recommend Oasis restaurant with the owner Mike who always welcome Navigare clients and help to moor your yacht if you happen to get a spot right outside the restaurant. Spetses, this island is very popular for Athenians and Greeks visiting the area. It is known to be exclusive with high quality restaurants, nice little boutiques and many bars. There are also many nice beaches that you can reach by horse carriage or you can take a taxi boat cross the bay to Porto Heli – mainland for swimming. Plaka, (this) little village is located on the Peloponnese – mainland. Well worth a visit with very welcoming people, restaurants and a big night club. There is a very nice beach to enjoy a lazy day in the sun. If you like to explore cultural sights, we recommend to take a taxi to the monastery situated on a hill top (4000 meters above sea level). Amazing view! For dinner you should try Margret and Michael’s restaurant. They may find you before you find them. Very nice people and good food. The island of Dhokos has no inhabitants so you anchor up in a natural bay and enjoy being one with the stars at night. Not much more is needed to say – if you have some nice company, food and drinks it’s a great experience. The isolated island of Dokos or Dhokos has several anchorages. During the day, especially in the weekends, there are many boats here but, in the evening, it is very quiet. There is only one family on the island who runs a rather indifferent but expensive restaurant. 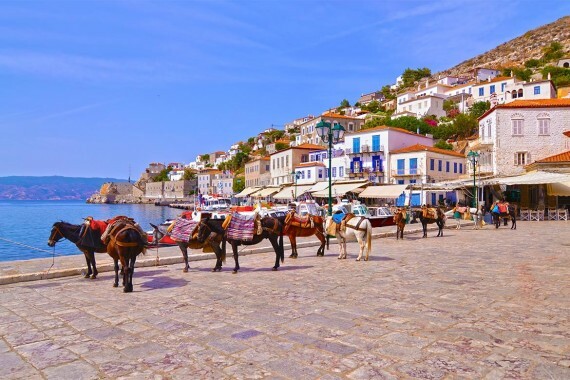 Hydra (7 NM) – Hydra is a very charming island with no cars. You can get around the island by donkey. This island is also very popular with Athenians a nd celebrities alike. Onassis is known for having brought famous people here to party. The harbor is very small, and it is common to moor third, fourth line. The port itself is small and charming and the close surroundings are worth a walk to see. We recommend a nice dinner followed by a drink at sunset. “Hydronetta” is very nice bar to choose for a spectacular view of the beautiful sunset. Agios Kosmas Marina – heading back to do check out by 17:00. It will take about 8 hours to reach Elliniko so it is advisable to start early and prepare some nice activities and lunch/snacks for the journey. If you are lucky you will have dolphins following you on the way back. The Saronic area, divided in two parts (coast around Athens and the one around East Poros and Hydra), is a great place to start the sailing route as it is the most famous sailing area in Greece. Winds usually blow NE and the „Meltemi“ lasts from mid-July all the way to late September. These characteristics make it easy to go up to 5-6 (35 to 40 knots). Sailing from Agios Kosmas Marina in Elliniko (Athens) is a perfect way to discover Saronic Gulf and Saronic islands. This 7-day sailing itinerary includes the islands of Aigina, Spetses, and Hydra, including Epidaurus on the Peloponnese semi-island. 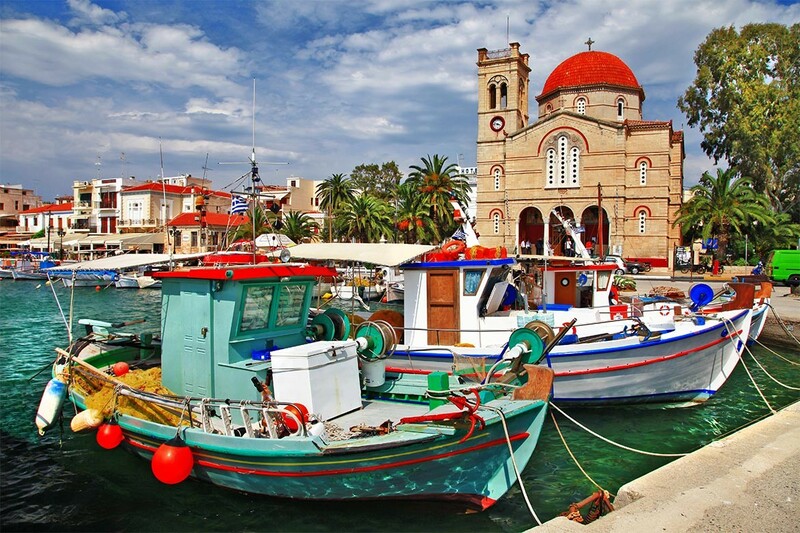 The first destination is the Island of Aegina, located on the southwestern coast. It will keep you amused and amazed, as it has a lot of content to offer: fruit boats and supermarkets (if you need to provision your yacht, this is the place! ), taverns on the town quay, and historical monuments (the Church of Aigos Nikolaios, Temple of Aphaea). Both of these locations are full of charming little streets filled with local restaurants, bars and shops, so you will get a good view of the local way of life. Besides exploring the cities by foot, don't forget to also enjoy the crystal clear sea (by swimming and/or snorkeling)! 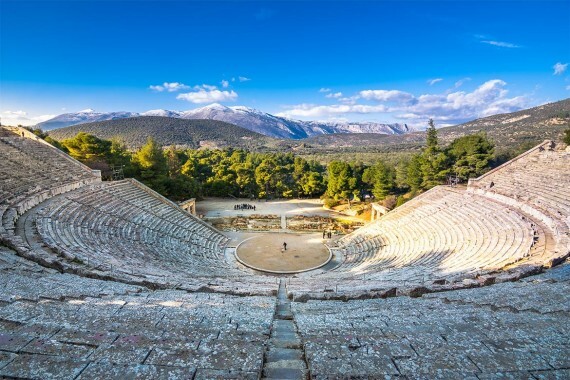 Epidavrus will overwhelm you with its rich cultural and historical locations. The Theatre of Epidavros, enlisted on the UNESCO World Heritage Site, was constructed in the 4th century BC and still puts on plays during the summer months, so we highly recommend you visit a play as the theatre gives a unique acoustic experience. You should also visit the other monuments incorporated in the Sanctuary of Asklepios, such as: Temples of Artemis and Asklepios, the Tholos, the Enkoimeterion and the Propylaia. You can spend the rest of your time further exploring the acropolis ruins of Epidavros. Head to Poros. This island offers shopping, water sport and land activities – renting a bicycle/scooter or similar. For the kids, there are several bays and beaches to explore by swimming. Mega yachts, fishing boats and sailing yachts all share the marina, so if you want a good spot, you have to arrive by early afternoon. There are many restaurants to choose from: we can recommend Oasis restaurant with the owner Mike, who always welcomes Navigare’s clients and help to moor your yacht if you happen to get a spot right outside the restaurant. 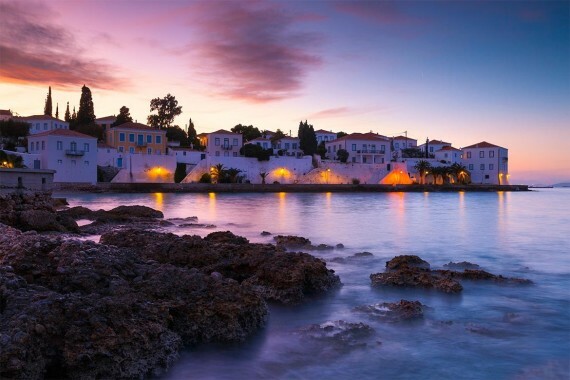 Spetses, a very popular island for Athenians and Greeks visiting the area. It is known to be exclusive, with high quality restaurants, nice little boutiques and many bars. There are also many nice beaches that you can reach by horse carriage or by taxi boat across the bay to Porto Heli – mainland for swimming. 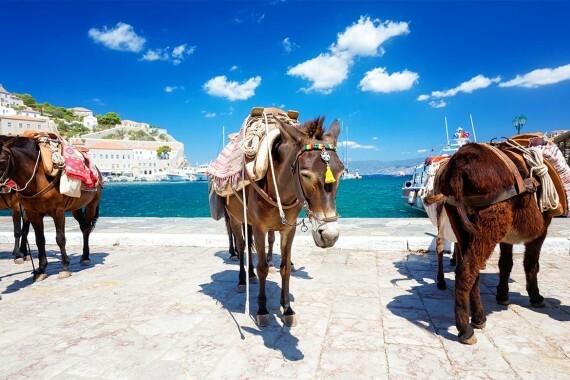 Hydra is a very charming island with no cars, so you can get around the island by donkey. This island is also very popular with Athenians and celebrities alike. Onassis is known for having brought famous people here to party. The harbor is very small, and it is common to moor third, fourth line. The port itself is small and charming, and the close surroundings are worth a walk to see. We recommend a nice dinner followed by a drink at sunset. Hydronetta is a very nice bar to choose for a spectacular view of the beautiful sunset. Perdika. Perdika, a village on the eastern coast of Aigina, is best known for its gastronomic and sports offers: here you can taste the best seafood, do a wide range of water sports, as well as enjoy the nature all around you. It is a great place to immerse yourself in the local way of life and traditions, as Perdika is an old fishing village with ancient architecture. When it comes to sailing, we advise to be careful when anchoring in the bay as the water can get quite shallow. Moni and Angistri islets. Opposite Perdika you fill find these two islets reachable by trip boats. They are renowned by their untouched nature, clear water and dense vegetation, all of which gives you a great mini getaway. Enjoy some time diving and snorkeling around many coves and caves that hide a rich sea life. Return to the starting point, Ag. Kosmas Marina. Desembarkation. Sailing from Agios Kosmas Marina in Elliniko (Athens) is a perfect way to discover Saronic Gulf and Saronic islands. This 7-day sailing itinerary includes the islands of Aigina, Spetses, and Hydra, including Ermioni on the Peloponnese semi-island. Ermioni. 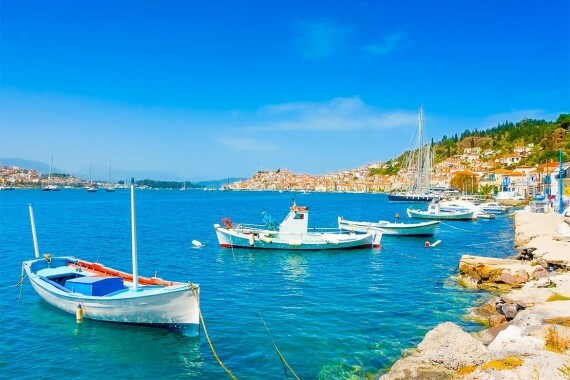 If you could summarize your Greek sailing experience in one town, it would be Ermioni. It is a small town located opposite Hydra in which you can find cultural and pass-time activities both day and night. It is a traditional town, but very well adapted to tourists as it has a lot of restaurants, bars and shops. If the history interests you, you could visit the historical sites such as the Church of Taxiarchon and the ancient remains. After walking around and exploring the architecture, you could spend your time doing one of the water sports and enjoying the sun and the sea. Ermioni has it all, you just have to choose! The Island of Aegina, located on the southwestern coast will keep you amused and amazed, as it has a lot of content to offer: fruit boats and supermarkets, taverns on the town quay, and historical monuments (the Church of Aigos Nikolaios, Temple of Aphaea). Both of these locations are full of charming little streets filled with local restaurants, bars and shops, so you will get a good view of the local way of life. Besides exploring the cities by foot, don't forget to also enjoy the crystal-clear sea (by swimming and/or snorkeling)! Elliniko will introduce you to Greece´s traditional cuisine (we recommend visiting Floisvos and Avli), beautiful nature (beaches Faros and Marathonas, and the Islet of Moni) and interesting historical surroundings. Sailing in the Cyclades is recommended to experienced sailors and you must be prepared to strong winds, but if you are, you may find good sailing as well as the traditional Greek style white and blue houses. Leave for Cape Sounion. 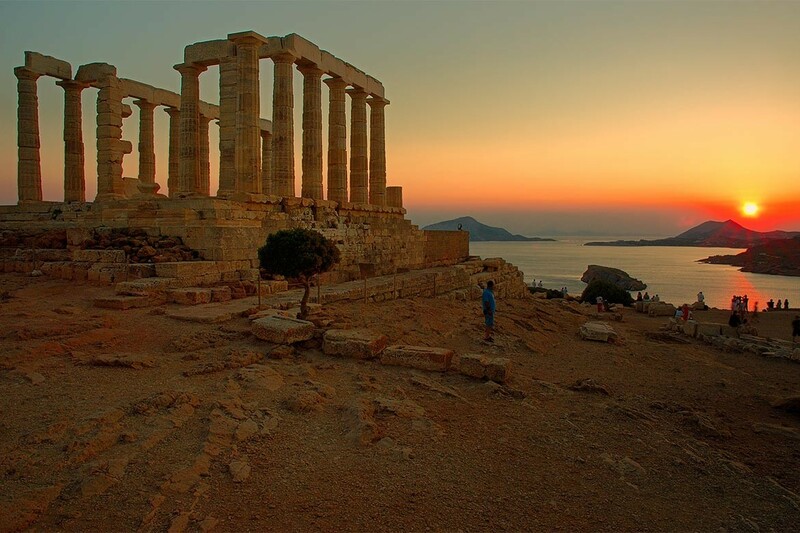 The bay at Akra Sounion is not a harbour, but can be a useful stop and to visit the 5th century temple of Poseidon. This is clearly visible on the Cape from a distance and is easily reached after a short walk. Anchorage at 37°3 9.2' N, 024°01.35' E.
This morning you may sail to Loutra on the northeast side of Kithnos. In Loutra the harbor is well sheltered from all directions if you stay inside of the mole.You will find a few taverns and you may be served your dinner on the beach. 25 nm east of Loutra you find the very nice place Finikas at the southwest part of Siros. This small harbor is well sheltered except from south wind. You can go stern to a mole and in some places there you find mooring lines. You also can take a morning swim directly from your boat since the water is very clear. From Finikas to Mykonos it ́s 25 nm. In Mykonos you have to find a place in the harbor inside where the huge ferries stay. From this harbor it ́s 2 km south to the very nice small town. However, the Island is extremely touristic and numerous busses transport thousands of visitors from the ferries into the town for a short visit and then it is crowded. Close to the port you can hire a bike and drive to town or take a taxi or even take a walk but try to go there when the ferry guests are not there. If you like to party you have found the right place! If you like to avoid the crowd and the weather is calm you can sail to Dilos south of Mykonos town and 22 nm from Finikas and anchor over night.Inside a bay there is a small mole where you sometimes can moore longside. 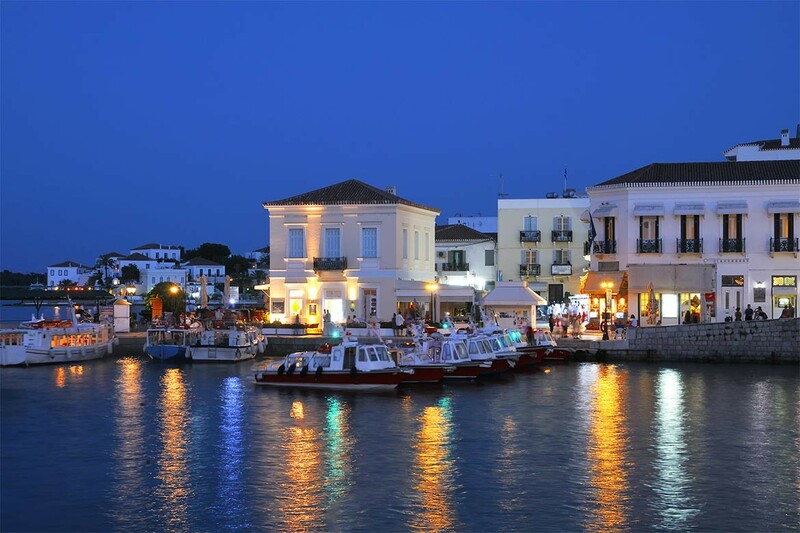 From Mykonos there is a 25 nm long trip south if you want to visit Paros town at the northeast side of the Island. Destination for the night is Skhinoussa, a small island in the “Small Cyclades”. For some reason this area is usually calm even if the meltemi is blowing strong elsewhere. Skhinoussa is a small very quiet and peaceful place. The small mole is often occupied and then you have to throw anchor and bring a line ashore and use the dinghy. One of the taverns is serving a delicious lobster in spaghetti. On the way to Skhinoussa a short stop at the west bay of Iraklia is recommended. You pass a small islet west of Iraklia and directly after you will find a bay. Far inside the bay there is a small bouy floating and just underneath in 3 meters depth you can find a small aero plane from World War II. If you continue sailing east 25 nm you will arrive at the port of Amorgos. Across the bay there is a pub/tavern that every day show the movie “Deep blue” that was filmed in Amorgos. The chora high up over the harbor is very nice and if you continue to the east side of the island you will find a monastery attached to the steep mountain wall. To hire a bike is a good idea but drive carefully as the roads often are slippery like ice even when dry! Time to go southwest to Ios (35 nm), one “party island” with a lot of pubs, bars, restaurants and discos. 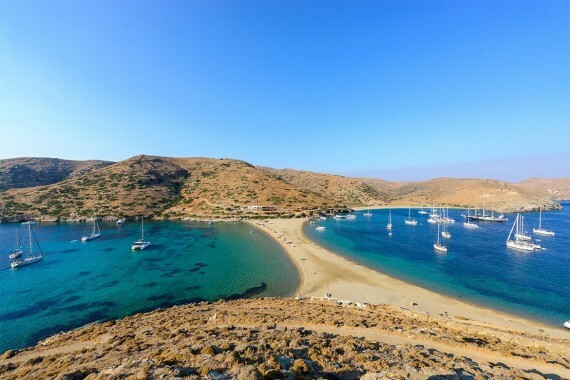 Starting to go north you will find Vathi in Sifnos, a laidback place and worth a visit (24 nm). Continue another 4nm north you will find a little larger port named Kamares. From Sifnos you can sail north to Serifos (26nm). The bay on the south coast is well sheltered from north waves although the wind may blow strong. The town (chora) is laying high above the harbor and from there you have a magnificent view. When leaving after breakfast you continue sail north to a bay on the west coast of Kithnos if the forecast predict a calm night, 37*24`5N 24*22´5E (25nm). The harbor on northwest side of Kea is 20 nm away further north. When you arrive to the entrance of the bay you can turn starboard into the main port Korissia. There you can anchor and go tern to but be sure to test your anchor grip as the bottom has bad holding at places. Instead of turning starboard you can go straight into the bay of Vourkari. There you can go stern to the mole (shallow at places, check the Greek Waters Pilot). The place is calm with only e few taverns along the mole and one at the north side of the bay. There is also good holding to anchor out in the Vourkari bay. If the weather forecast predicts north light wind you can stay in the southwest bay of Kea, 13 nm from Vathi, and enjoy a morning swim.